The streets of San Pedro Tapanatepec in the state of Oaxaca, Mexico changed overnight. The tranquil town in south-western Mexico was interrupted by the bustle of thousands of migrants, mostly Honduran, who stopped to rest for a few hours in between long days of walking on their journey toward the U.S.-Mexico border. Among those who arrived, are Raquel and her parents. The newborn barely opens her eyes and her tender fingers move slowly while her father, Ernesto, uses a piece of cardboard as a fan to protect her from humidity and heat. "We are here because of the heat, but at night we go to the shelters," said Ernesto, who is accompanied by his wife and two other daughters, a 4-year-old and a 6-year-old. Ernesto, who did not share his last name and asked not to be identified on camera, said he fears for his life and his safety is in under constant threat in Honduras. It was a sentiment shared by several of the migrants NBC 7 and T20 spoke with while traveling with the caravan from Tapanatepec northwest to Santo Domingo Zanatepec. Maryui Elizat said that if she returned to Honduras, she would fear violence and face hunger for the rest of her life. She is eight months pregnant and scheduled to give birth in less than three weeks. Elizat still has several hundred miles ahead of her before reaching the border, where she, along with others in the caravan, planned to seek asylum to gain entry into the U.S. They traveled approximately 25 miles Monday through the state of Oaxaca. The caravan of thousands is made up of hundreds of children like 9-year-old Aisleen. "I feel a little happy, but like, I have a little bit of fear. I feel a little nervous," the young girl said. "But first, God, let's get there." Aisleen's mother, Eucebia Domínguez, only brought one of her three children along for the long journey. Aisleen admitted that the hardest part of the journey hasn't been the walking, but the fatigue and hunger is what haunts them. When the migrants can rest -- trying to fight exhaustion, prevent illness and deportation during the journey -- they are helped along the way by locals. The Mexican Red Cross has also been offering assistance. "Thank God, they have supported us a lot, just like when we were in Guatemala, they supported us a lot," said a migrant in the caravan. Angela Corté, a merchant in Tapanatepec, made a salsa and cheese for the migrants. Corte told T20 that it was all she could afford to offer. 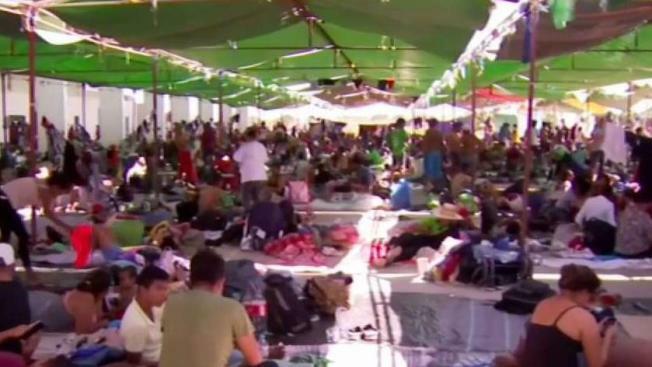 Meanwhile, other Mexican residents along the route have opened their homes and business for the migrants to charge their cell phones and provided water drums for them to bathe in. Some preferred to clean themselves in the rivers that run along the road. When they change their clothes, the migrants shield one another. And although they carry very little money, with all the help they've received, they haven't lacked anything. Nine-year-old Aisleen wants to get an education when she arrives in the U.S. She said while the path to get there is long, she knows it will be worth it. "We are going to get there; we have faith that we are going to get there, and you know, only God can break barriers," said Eucebia Domínguez, citing scripture.